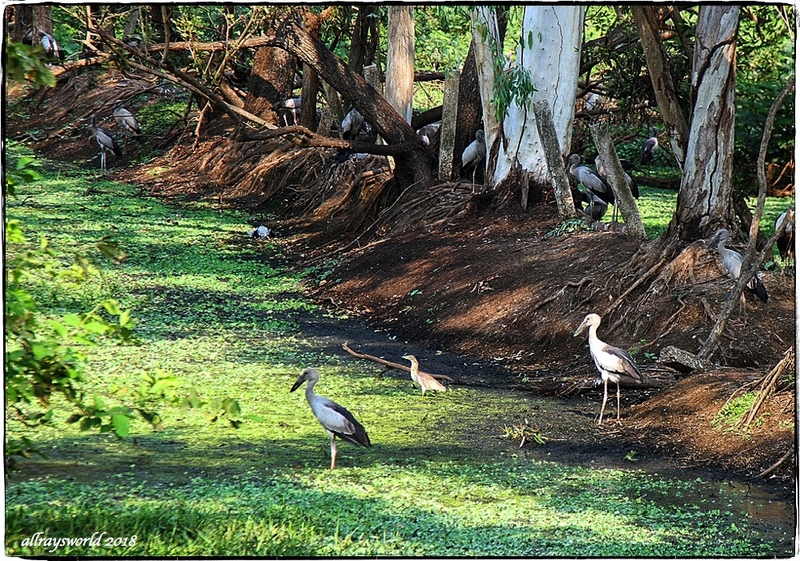 Recently we stumbled upon a Bird Sanctuary only 35 kilometres from our Village. The top picture suggests it may contain a rookery for Open-beak Storks. How wonderful! These are so lovely - I'll await your return! Ray: From my quick look, Elizabeth, it looked like mostly waders...storks, herons, egrets...but there might be others there, too. Ray: Il semble que ce soit un endroit idéal pour les oiseaux, Martine. It's an odd thing to say, let alone think, but they all look very happy and contented in your shot. Maybe this is toad-heaven, so under those circumstances they would be..
Ray: Yes...it is easy to imagine these storks are smirking as the contemplate their good fortune to have this refuge, Chris...they are hunted for food in some other places. Oh, so many storks! I hope there are enough frogs for them. Ray: These are Open-beak Storks, Philine, and their main food is snails...but, there seems to be plenty for them. Ray: Je m'attends à avoir du temps pour une visite plus longue, avec un meilleur équipement, dans un mois ou deux, Claudine. Ray: I should be able to get a few close-ups of the birds, Bill. What a great find and so close to home. It looks like the bill gets bigger with age as deduced from that top shot. I would love this place. Ray: I believe you are correct about the beaks, Mary...these youngsters don't yet have full-sized ones, and they do not have the open part that is especially for gripping snail shells. I guess you might become a regular visitor with it being so near to home. Ray: I am too busy to be a frequent visitor to this place, Brian...but will try to visit occasionally. this species of storks has a bit more stubbier beak than what i would have imagined, Ray. will look forward to your shots from this place in the future. Ray: Most of these critters are youngsters, Ayush, and their beaks are not yet fully grown. What a wonderful find. They appear to have their beaks shut, though. Ray: Nothing to say, I suppose...many politicians could do well to learn from this, eh! Great shots, Ray - best camera or not! Ray: Thank you, Tom...I had the right camera but the wrong lens...the 24-105 is a fine walkabout lens but a little limited when it comes to wild birds.